As a diagnostic tool, modern veterinary medicine relies on digital X-rays for pets as a method of examining your pet. While some people might think that pet X-rays are limited only to situations in which bones are involved, the versatility of this crucial diagnostic tool cannot be overlooked. The doctors and staff at SRVC use X-ray to thoroughly examine many of your pet’s vital body systems, including the abdomen, lungs, oral cavity, heart and other areas. Using digital X-rays for pets provides an effective method of both diagnosing and monitoring the treatment your pet receives. In addition to broken or fractured bones, digital x-rays can help a vet detect heart issues, tumors and obstructions within your pet’s body. They provide an invaluable tool that the staff at SRVC uses to monitor a number of different surgical and medical conditions. At SRVC, we believe that providing access to high-quality diagnostic tools is a vital component in delivering an excellent standard of care to pets in Little Rock and the surrounding areas. When compared to standard X-ray machines, a digital X-ray simply offers benefits that help to ensure a better experience for pets and their owners. It also provides veterinary staff with better diagnostic tools. One of the primary advantages of using an advanced X-ray machine is the unparalleled range of medical conditions that can be diagnosed quickly and accurately when compared with the capabilities of a standard X-ray machine. 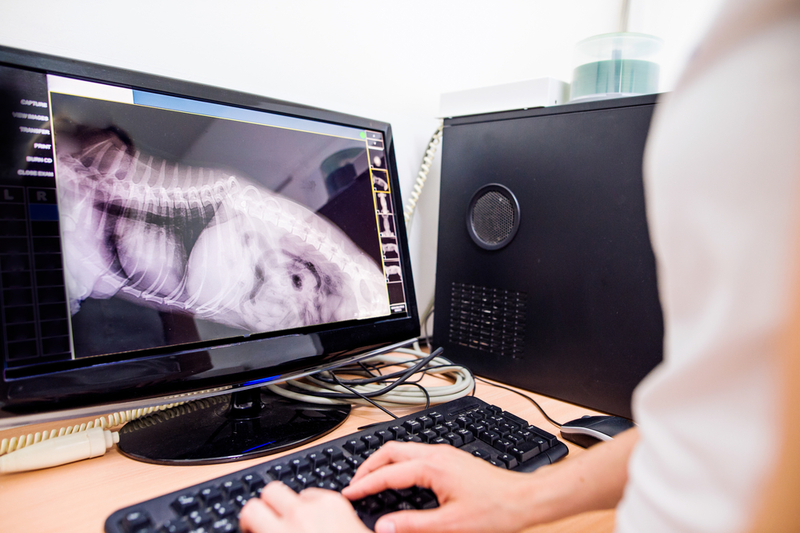 The staff of SRVC takes highly detailed X-rays of your pet, manipulates them to focus on the precise area in question, and displays them on a computer screen so you can easily grasp the situation at hand. Another advantage of using the latest technologically advanced digital X-rays is that fewer images of your pet need to be taken. This means less time is spent on the X-ray table during a period of time when your pet is probably already feeling uncomfortable. Because pet X-rays can be shared via email, the time spent obtaining a second opinion or a diagnosis from a specialist can be significantly reduced, leading to more prompt and better care for your pet. Digital pet X-rays can be viewed in all of the treatment rooms at SRVC using tablets, enabling our doctors and staff to effectively diagnose and treat your pet. Contact SRVC today to schedule your pet X-rays or for more information about the services we offer pets in Little Rock and the surrounding areas.